Mitchell E. Widom is passionate about many things in life — his family, his clients, fly fishing and medical research. And every year, he brings all those elements together to raise funds for the Crohn’s & Colitis Foundation of America (CCFA). “It’s very special to be able to do something you love and do something good at the same time,” says Widom, who leads the Litigation Practice Group at Bilzin Sumberg and represents commercial clients in high-profile national cases. Eleven years ago, Widom’s oldest daughter Taylor was diagnosed with Crohn’s disease at the age of 10. With his brother Glenn, who is also an attorney, Widom started the Sabadell United Keymorada Fly-Spin Invitational Tournament, a three-day fishing tournament in the Keys to support research into this chronic inflammatory bowel disease. In the past decade, the annual Keymorada Tournament has raised $5.1 million and supported the founding of the first Crohn’s and Colitis Center in South Florida at the University of Miami. Last year’s event raised $572,000 and Widom is looking forward to beating that total in the next fishing tournament on May 10-13, 2016 at the Cheeca Lodge in Islamorada. As a litigator, Widom is committed to making a difference for a wide range of commercial clients. 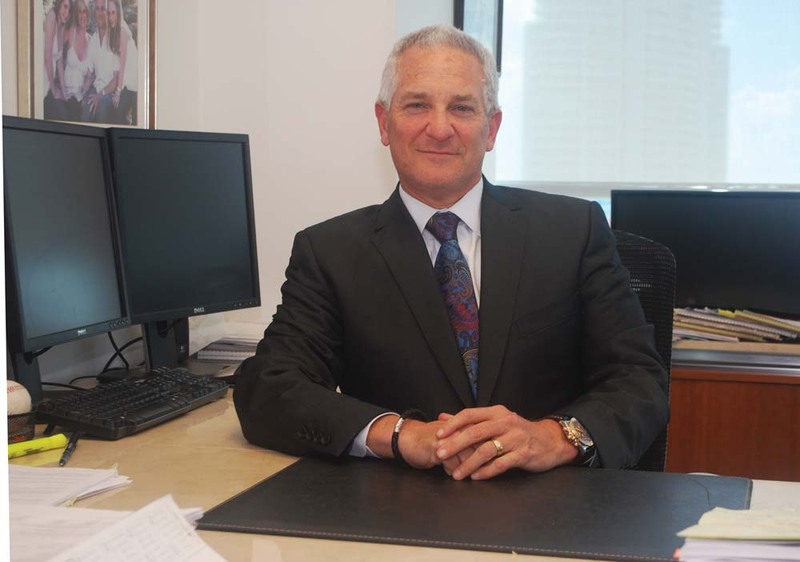 In a career spanning more than 30 years, he has handled disputes related to antitrust, probate, construction, intellectual property, partnerships, insurance, land use, bankruptcy preference and fraudulent transfers among other matters. He has been appointed more than 25 times to act as a special master for evidentiary hearings and discovery disputes in Miami-Dade County. Well-known in legal circles for assisting major corporate clients in prominent jury trials, Widom is currently representing Honda in connection with claims relating to Takata’s frontal airbags. This is one of the nation’s largest multi-district litigations (MDL) involving more than 30 million vehicles in the U.S., made by 10 different automakers. Widom also works as part of Bilzin Sumberg’s antitrust litigation team in the precedent-setting liquid crystal display (LCD) price-fixing antitrust litigation in California as part of another nationwide MDL. This is one of the largest antitrust cases in U.S. history. “Leading manufacturers of LCD screens criminally conspired to fix prices on those screens from 1998 to 2006,” says Widom, adding that the firm’s clients sought damages of more than $500 million in the case. In that case, Lennar had sold property to another developer believing that a master concept plan was in place that entitled the land for future building, Widom says. “However the plan had expired without Lennar’s knowledge. We showed that the buyer was a sophisticated developer who had signed contracts that specifically disclaimed any entitlements on the property.” This trial victory won Widom “The Most Effective Lawyer” award from the Daily Business Review. Having led the litigation group for six years, Widom is proud the Bilzin Sumberg team has won the “litigation department of the year” award from Benchmark Litigation for the past two years. “That’s a testament to the excellence of the 23 lawyers in our group,” he says. Widom comes from a family of legal professionals including his brother, sister Ilisa Hoffman, sister-in-law Ellen Widom, and both of his brothers-in-law, Richard Hoffman and Mitchell Cook. In addition, his mother Rita Swichkow represents abused and neglected children as lead guardian at litem in Miami-Dade County courts. Widom earned an undergraduate degree in accounting with honors at the University of Florida. “We’re a three-generation Gator family, as my stepfather, Bernie Swichkow is an alumnus, and my two daughters and niece are students there now,” he says. After earning his degree and taking the CPA exam, Widom realized he would prefer a career as an attorney and returned to Gainesville for his law degree. “My first year in law school, I was able to clerk for Podhurst Orseck, where Bob Josefsberg was my mentor,” he says. “I knew then that I wanted to be a trial lawyer,” he says. After passing the bar, Widom went to work in the Miami office of Philadelphia law firm Blank Rome Comisky & McCauley, where he tried his first case several weeks later. Now, Widom makes sure that younger attorneys at the firm have similar experiences in trying cases, taking depositions and handling motions. “Today, my favorite part of my practice is mentoring and training our associates,” he says.